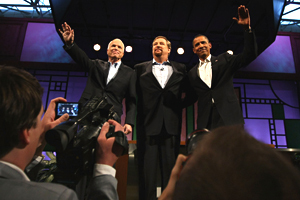 Religion played a much more significant role in the media coverage of President-elect Barack Obama than it did in the press treatment of Republican nominee John McCain during the 2008 presidential campaign, but much of the coverage related to false yet persistent rumors that Obama is a Muslim. Meanwhile, there was little attempt by the news media during the campaign to comprehensively examine the role of faith in the political values and policies of the candidates, save for those of Republican vice presidential nominee Sarah Palin. And when religion-focused campaign stories were covered by the mainstream press, often the context was negative, controversial or focused on a perceived political problem. 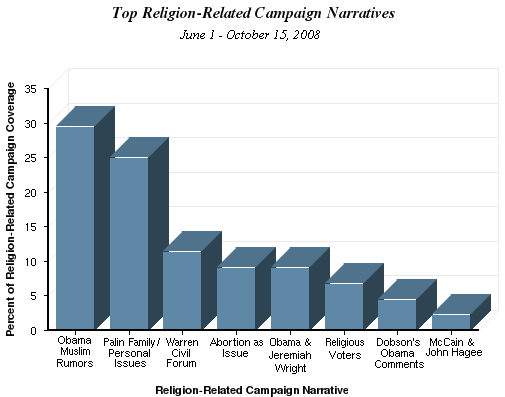 In all, religion was a significant but not overriding storyline in the media coverage of the 2008 campaign. But in a campaign in which an Obama victory would give the U.S. its first black president, religion received as much coverage in the media as race. The “culture war” issues that have been prominent in past elections, such as abortion and gay marriage, received minimal attention in 2008. The coverage they did receive tended to come in the form of reaction to statements by the candidates and quickly receded without generating any sustained narrative. When Palin was introduced to the nation as McCain’s running mate, her parenting choices raised the issue of abortion, but only momentarily. In one of the more episodic narratives – evangelical megachurch pastor Rick Warren’s presidential forum held at his church – the candidates’ answers on a question about abortion gained attention in the press the week of the event. But the religious electorate – including evangelical voters – received relatively scant attention from the press during the general election, despite the Obama campaign’s aggressive outreach efforts and the subsequent gains made among these religious groups on Election Day. Press narratives tied to religion accounted for 4% of the general election campaign’s “newshole”- the time or space available in an outlet for news content. While this was less than coverage of the Iraq war (6%) or the economic crisis (9%), it was more prominent than coverage of energy issues (2%) and the environment (less than 1%), and equal to coverage of the Republican National Convention (4%). During the general election, storylines related to religion received as much attention by the press as those that focused on race (4%). Far more of the religion storylines involved Obama, and most of these involved controversy or had an unfavorable cast. In all, Obama was the lead newsmaker in more than half (53%) of the religion-focused campaign stories. By contrast, McCain was the focus of just 9%. Palin (19%) was more tied to religion than her running mate, though less so than Obama. Examination of Palin’s family values, church background and related issues made up one-fourth of the newshole devoted to religion in the campaign. The single biggest religion storyline in the general election phase of the campaign centered on rumors that the Democratic nominee, who is a mainline Protestant Christian, is a Muslim (30%). An additional 5% of the religion-focused coverage dealt with evangelical broadcaster James Dobson’s criticism of Obama’s positions. But despite the largely negative focus of the Obama religion coverage, a Pew Forum analysis of exit polls shows nearly every religious group measured supported him in greater numbers than they supported Democratic nominee John Kerry four years ago. The notion of “pastor problems,” or candidates’ associations with controversial religious figures, was a clear narrative in campaign coverage. All four candidates faced coverage focusing on religious figures. Attention to clerics Jeremiah Wright, Michael Pfleger and John Hagee alone made up 11% of religion coverage in the general election. A feature of much of this coverage was replaying of the inflammatory recorded words and video images of these ministers. Circulated on cable news, talk radio and the Internet, these recordings were used to scrutinize the candidates’ judgment in associating with such figures. The Aug. 16 Saddleback Civil Forum on the Presidency, moderated by Warren at his California megachurch, drew brief but intense media coverage. It made up 10% of all campaign coverage the week it occurred but quickly dropped to 5% the following week. By the end of August, it was no longer a major press topic at all. Still, that was enough to have that one event account for 11% of religion-focused campaign coverage in the general election. Culture warissues were not a driving narrative of this election cycle. The extent to which they were present, they emerged late in the campaign and were largely tied to the nomination of Palin. Together, social issues – including abortion, gay marriage and stem cell research – composed 9% of religion-focused campaign news but less than 1% of campaign news overall. Abortion was by far the biggest of these, again, largely focused on Palin. The study examined 7,592 campaign stories from 48 news outlets during the general election, from June 1, 2008, the week that the primaries ended and Hillary Clinton suspended her campaign, to Oct. 15, 2008, the day of the last presidential debate. The 283 stories in which religion played a significant role were analyzed in greater depth. This study builds on an earlier one jointly conducted by the Project for Excellence in Journalism and the Pew Forum that examined media coverage of religion in the primary campaign (see methodology).That earlier study is in some cases referred to here for comparison. The projects are both funded by the Pew Charitable Trusts. 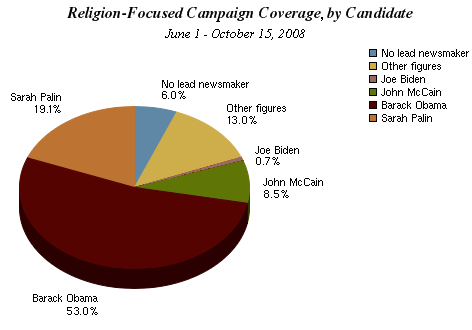 Religion-related campaign coverage focused far more on Obama than it did on any other single figure during the general election. He was the lead newsmaker in more than half of the religion-related stories, while McCain was a lead figure in less than one out of 10. (If 50% or more of a given story is about one person, that individual is credited as the lead newsmaker.) This lopsided attention to Obama echoed a trend observed in the pre-primary and primary season. Between January 2007 and April 2008, Obama was the subject of 55% of religion-focused coverage, while McCain occupied less than 1%. In the general election stage of the race, even Palin received more religion-related coverage than McCain, occupying the lead role in 19% of such coverage. Vice President-elect Joe Biden, by contrast, was a lead newsmaker only about 1% of the time. 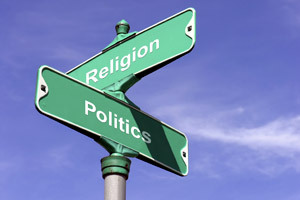 When looking at religion coverage compared with other topics in the campaign, the data suggests that faith was indeed a significant part of the narrative. Even in a campaign where race-related themes were at least a constant subtheme, that topic did not eclipse religion-focused coverage (each occupying 4% of the campaign newshole). Indeed, race and religion often intersected in campaign media coverage. Still, religion (and race) as a media focus was secondary to economic and international concerns and speculation over how the next administration would address them. The economic crisis (9% of overall campaign coverage) and the Iraq war (6%) figured more prominently than religion. Other issues such as energy (2%) and the environment (less than 1%), which had been hot-button items earlier in the year, received less attention than religion-focused coverage, and the Republican National Convention (4%) received about the same amount. Rumors that Obama is a Muslim, the top religion storyline of the general election, started as early as 2004 but took hold in June 2008 as the general election phase of the campaign began. The rumors then maintained a stubborn presence, both in the press and in public opinion, throughout the duration of the campaign. After appearing on FreeRepublic.com, a self-described forum for “independent, grassroots conservatism,” rumors of Obama’s Muslim roots took on a viral life online, in the blogosphere and in e-mail inboxes. The widespread nature of the rumors became fodder for cable news talk shows as well. These rumors then found their way into the mainstream media and never fully disappeared. During the general election, nearly a third (30%) of religion-related campaign coverage addressed this topic. A good deal of the continued attention rested on the Obama campaign’s efforts to set the record straight. One such incident occurred in June when Obama staffers removed two women wearing head scarves from the camera view at a campaign rally. Conservative radio talk show host Rush Limbaugh said the campaign’s move symbolized Obama’s broken promise to “transcend identity politics.” On the June 19 episode of Fox News’ Hannity & Colmes, a video clip quoted the brother of one of the women, who speculated that the Obama campaign “wanted to make sure, in my opinion, that no one will correlate a Muslim girl in the back with him being Muslim.” MSNBC’s Dan Abrams summarized on June 18 that the consensus among pundits was that the incident hurt the candidate. The Obama team set up a website, www.fightthesmears.com, as a tool to identify and root out inaccuracies about the candidate’s religious background, among other rumors. The June 13 broadcast of ABC’s Good Morning America aired an entire segment on the site and many other outlets also covered the new site. A controversy over the July 21 edition of TheNew Yorker magazine is a case in point. 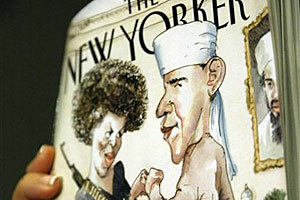 The magazine’s cover featured a satirical rendering of Obama in traditional Muslim attire, including sandals, robe and turban. Though the magazine’s editor said the intent of the cartoon was to combat those spreading the rumors – the title was “The Politics of Fear” – its provocative nature drew a good deal of media attention, fueled by the fact that the Obama campaign publicly rebuked the magazine. The week TheNew Yorker hit newsstands, July 14-20, stories about the cover occupied 10% of the campaign newshole. In the end, did efforts by the traditional press to set the record straight strengthen or lessen the impact of these rumors? Press coverage of efforts to curtail circulating rumors or to correct inaccuracies may have added to the overall impact of the rumors in the end. By simply reporting on the rumors’ influence on public opinion, the press heightened their presence in the news. 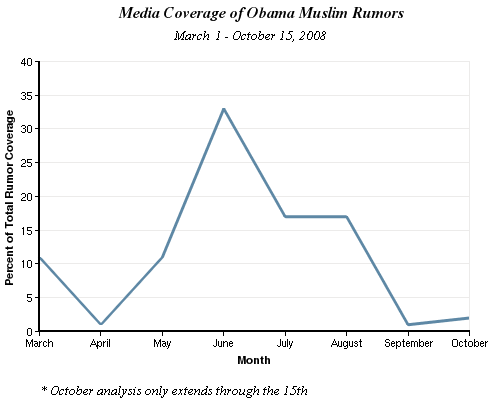 It is always difficult to identify cause and effect, but the evidence suggests at minimum that the coverage did little to persuade or disabuse those people inclined to believe Obama is a Muslim. In June, the month before TheNew Yorker cover appeared, 12% of registered voters believed that Obama is a Muslim, according to a survey by the Pew Research Center for the People & the Press. By October, the media’s attention to the rumors had significantly subsided, but polls indicated that their resonance had not. Only weeks before Election Day, the same number (12%) still thought Obama is a Muslim, according to another Pew Research Center survey. By this time, news audiences were being exposed to voter anxiety over Obama’s religious affiliation in ways that extended to questions of ethnicity, nationality and patriotism. One such instance occurred at a McCain town hall-style meeting. A woman in attendance stood up and voiced her concern about Obama, saying, “I have read about him … he’s an Arab.” McCain removed the microphone from her hand and corrected the woman, saying “No, ma’am. No, ma’am. He’s not … He’s a decent family man, citizen, that I just happen to have disagreements with on fundamental issues.” The incident, which was captured on video, was replayed on network and cable newscasts. The candidates’ connections to religious figures with unusual or controversial views became a media narrative this year. Each of the major presidential candidates and their running mates were at some time dogged with stories related to religious leaders. In a roundabout way of probing the beliefs of both parties’ tickets, the press honed in on the words and actions of religious figures associated with all four. What the press did not do, generally, was take those words to the next level, looking deeper into the candidates’ beliefs to examine how they influence their positions on issues and impact their policy decisions. As a recurring topic of press coverage, the personal religious beliefs of the candidates composed only 1% of the campaign newshole during the general election. But coverage relating to their pastors and religious advisors was 10 times that amount, making up 10% of religion coverage over the course of the general election. Much of the trouble the candidates faced with their religious associations stemmed from video or audio recordings that captured these leaders speaking in houses of worship. In made-for-video moments, these recordings became widely circulated and were replayed and analyzed on political talk shows, blog posts and YouTube. Media attention to Obama’s relationship with his former pastor, the Rev. 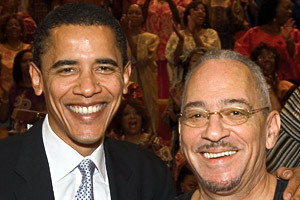 Jeremiah Wright, and Trinity United Church of Christ – Obama’s church in Chicago until he resigned his 20-year membership in May 2008 – was one of the big stories of the primary season. The issue waned during the general election but was still the biggest “pastor problem” faced by any of the candidates. In the general election period, Obama’s former church and pastor made up 9% of the general election religion coverage and 13% of Obama’s. Looking at the entire primary season and general election period together – from January through mid-October – the Wright controversy was the single largest press narrative in the campaign, religious or otherwise. In addition to Wright, the controversy centered around two key events: inflammatory comments made by the Rev. Michael Pfleger, a controversial Catholic pastor, from Trinity’s pulpit and the Obama family’s formal departure from Trinity, the church where Obama and his wife, Michelle, were married and Obama and their children were baptized. Even then, the issue did not disappear in some voters’ minds. An Oct. 14 CBS News/NewYork Times poll released three weeks before Election Day found 11% of voters were bothered by Obama’s past associations with Wright. Obama also faced pointed public criticism for his policy positions from an evangelical leader with whom he had no ties – the Rev. James Dobson, founder of Focus on the Family and host of a weekday radio show broadcast on more than 3,000 stations in North America. During the week of June 23-29, Dobson’s criticisms of Obama – that he was “distorting the traditional understanding of the Bible” – accounted for 6% of the campaign newshole – the fourth-most prominent campaign narrative that week. This storyline disappeared almost as rapidly as it appeared, but, over the course of the general election period, this narrative represented 5% of the religion-focused coverage. Palin was the most recent candidate to be linked by the press to controversial church leaders and practices. When the surprise choice of Alaska’s governor was first unveiled by the McCain campaign, members of the press scrambled to report on all aspects of her biography – including ties to Pentecostal and evangelical churches she has attended in Wasilla, Alaska. Some of the coverage was shaped by video and audio clips recorded in her church, an echo of the Wright controversy involving Obama. One audio clip taken at Wasilla Bible Church, a nondenominational, evangelical congregation, featured David Brickner, executive director of Jews for Jesus, an organization that seeks to evangelize Jews. In the sermon, which was available on the church’s website, Brickner described God’s “judgment of unbelief” of unconverted Jews. But a Politico report stoked the controversy. The Sept. 2 article said that “Brickner also described terrorist attacks on Israelis as God’s ‘judgment of unbelief’ of Jews who haven’t embraced Christianity.” Palin’s pastor, Larry Kroon, was recorded endorsing Brickner’s message, with Palin in attendance. The McCain campaign immediately issued a statement to distance Palin from Brickner, saying she did not know he would be speaking that day. Another incident linked to Palin focused on what was captured in another video. It featured Kenyan preacher Thomas Muthee praying for Palin as she launched her gubernatorial campaign in 2005. The video was taken at Wasilla Assembly of God, a church affiliated with the Assemblies of God, a Pentecostal denomination. Muthee is seen along with two other church figures laying hands on Palin, a common practice in Pentecostal churches intended to confer power and blessing on the recipient. Muthee’s prayer for Palin and her association with the church put a brief spotlight on Pentecostalism, which emphasizes such practices as speaking in tongues, prophesying, divine healing and other miraculous signs of the Holy Spirit. Both Brickner and Muthee were the subject of news reports in Politico, the AOL news website, TheAtlantic and MSNBC’s Countdown with Keith Olbermann. A headline about the Muthee incident, which sensationalized the figure by calling him a “witch hunter” – Muthee had prayed for Palin to be protected from “every form of witchcraft” – remained on the Drudge Report’s website for days. Perhaps due to their late emergence into the campaign, these stories about Palin’s religious associations never snowballed to anywhere near the level of exposure given to Obama’s relationship with Wright or McCain’s association with Texas evangelical megachurch pastor the Rev. John Hagee. For McCain, the pastor predicament occurred at the end of the primary season, when Hagee, one of his endorsers, made comments that drew fire. Hagee, who later apologized, said Adolf Hitler had been fulfilling God’s will by hastening the desire of Jews to return to Israel in accordance with biblical prophecy. McCain then rejected Hagee’s support. It was mostly a short-lived incident but burst into McCain’s media coverage in the week just before the general election began. During the week of May 19-25, the story composed 8% of the total campaign newshole – but between June and mid-October, it dropped considerably, composing only 2% of all the religion-focused coverage for that period. This story gained little traction. While it is difficult to pinpoint the exact reason for the lack of coverage, McCain’s relationship with Hagee was less personal than Obama’s with Wright, and McCain made decisive and quick efforts to distance himself from the man. The press did not use the story to probe further into McCain’s religious faith. The issue lingered only briefly into the early weeks of the general election, accounting for 4% of McCain’s religion-related press between June and mid-October. TheNew York Times ran a front-page story on June 9 that focused on McCain’s efforts to woo religious conservatives but reported that some of these groups were wary of McCain given the way he distanced himself from Hagee. On May 23, a panel on CNN’s AndersonCooper 360° discussed the idea that the incident may have helped Obama with religious voters and may have hurt McCain. Biden was not criticized for a personal relationship with a controversial religious figure but rather for making comments at odds with religious leaders in his own faith. Biden, a lifelong Catholic who had considered becoming a priest when he was a student, was reproved by Catholic bishops for his stance supporting abortion rights and his interpretation of Catholic teachings on the issue. A local bishop from Biden’s hometown in Delaware, W. Francis Malooly of the Diocese of Wilmington, did not sign the Sept. 9 statement. But he wrote a public letter published in The [Wilmington] News Journal on Oct. 26 in response to a comment about abortion Biden made in an Oct. 19 interview. Malooly wrote that Biden presented “a seriously erroneous picture of Catholic teaching on abortion” when he said that the Catholic Church has ” ‘wrestled with this for 2,000 years,’ ” and when he “claimed repeatedly that the Church has a nuanced view of the subject that leaves a great deal of room for uncertainty and debate.” The bishop called these assertions “simply incorrect,” saying, “The teaching of the Church is clear and not open to debate.” The Delaware bishop’s letter received little national coverage. The reaction from Catholic bishops was reminiscent of the one John Kerry, also a Catholic Democrat who supports abortion rights, received during his run for the presidency in 2004. While it is difficult to evaluate the effect of the candidates’ connections to religious leaders on the election outcome, their presence in the 2008 campaign narrative stood out. Although the individuals focused on did not necessarily represent the personal religious beliefs of the candidates, they became linked with those candidates in press coverage. Their significance, perhaps appropriately, seemed to depend on how close the candidate was to the pastor. On Aug. 16, Rick Warren, an evangelical pastor and bestselling author of The Purpose-Driven Life, hosted a presidential forum at his Saddleback Church in Lake Forest, Calif. The forum occupied 11% of the religion coverage in the general election newshole. Although the candidates were asked questions about a host of issues, it was their answers to a question about the origin of life that took hold in the media analysis the next day. When asked for his perspective on when life begins, Obama responded that discerning the answer to that question with specificity was “above my pay grade.” McCain, by contrast, unequivocally said embryos have human rights “at the moment of conception,” an answer that seemed to appeal to the conservative evangelicals for whom the issue of abortion is crucial. A distinguishing feature of the coverage of the race was how – with the notable exception of abortion – there was little discussion of the culture war issues that have influenced American politics in the last several decades. Media coverage of abortion amounted to 9% of religion coverage in the campaign. Attention to gay marriage and stem cell research made up a fraction of 1% of coverage. In some ways, Palin became the media’s vehicle to touch on these issues. After her selection, Palin dominated election coverage for several weeks. According to PEJ’s Campaign Coverage Index, between Aug. 29 and Sept. 15, four of the top 10 storylines focused on her, accounting for 39% of all campaign coverage for that period, which includes religion-focused reporting. Much of that early coverage focused on her personal life, including her family values, church background and beliefs. But that initial focus had a strong presence in the religion narrative. Stories about Palin’s family background and beliefs accounted for fully 25% of campaign coverage focused on religious issues. The coverage later turned toward her public record and impact on the Republican ticket. Most of this coverage touched on, or speculated about, Palin’s views on abortion and family values in light of her choice to give birth to a baby with Down syndrome and her unmarried daughter’s pregnancy. These stories on Palin’s biography usually fell short of examining how her belief system informs her policy choices. Of all Palin’s religion-focused coverage, only 2% dealt directly with abortion policy implications, and 4% examined her religious belief system. Palin was quick to respond by saying that one cannot presume to know God’s will and indicating that was the intent of her original statement. Critics argued that Gibson took the quote out of context and failed to grasp the theological nuance of what Palin intended. 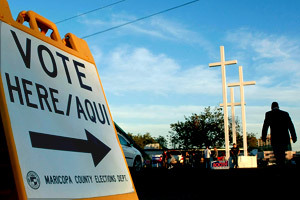 Generally, evangelical, Catholic and other religious voters received little coverage by the press in the 2008 election. Media attention to the religious electorate was minimal, a pattern reflected in coverage of the electorate overall. Only 7% of religion coverage in the election focused on these voting groups. Of this, evangelicals were more often the focus than other groups, and the efforts of the Obama campaign to reach these voters received special attention. But this coverage was the exception. The little attention by the press to the religious electorate is in line with the electorate overall. Media coverage notwithstanding, how important were religious voters to the 2008 election? A Pew Forum analysis of exit poll data shows that Obama received as much or more support among nearly every religious group compared with their support for Kerry in 2004. Still, a sizeable gap persisted between the support Obama received from white evangelical Protestants and his support among the religiously unaffiliated. Similarly, a sizeable gap favoring Republican candidates persisted between those voters who attend religious services regularly and those who attend less often. One of the most important shifts was among Roman Catholics, who supported Bush in 2004 but broke for Obama in 2008. Yet Catholic voters received less coverage than evangelicals during the general election. When Catholics’ political values and voting behavior were scrutinized, it was often found in the alternative religious press and among religion bloggers. All in all, the lack of any significant media attention to these voting groups underscores a general election in which sustained, thematic coverage of religion was eclipsed by scandals and events that found their way onto the news agenda more naturally. This report is based on additional analysis of content aggregated and coded for PEJ’s weekly News Coverage Index (NCI). The NCI is designed to provide news consumers, journalists and researchers with hard data about what stories and topics the media are covering, the trajectories of major stories and differences among news platforms. It examines the news agenda of 48 different outlets in five media sectors, including newspapers, online, network TV, cable TV and radio. The findings are released in a weekly NCI report. All coding is conducted in-house by PEJ’s staff of researchers continuously throughout the year. The complete methodology of the weekly NCI can be found at https://www.journalism.org/about_news_index/methodology. Main Universe of Stories: This report is based on NCI coding from June 1, 2008, through Oct. 15, 2008. All stories in which religious issues were a significant factor were isolated and further analyzed to locate the role of religion in campaign coverage in four and a half months of news – spanning the time the general election formally commenced to the date of the final presidential debate. This resulted in a total of 7,592 stories focused on the presidential campaign out of a total of 26,113 stories coded for this period: 584 newspaper stories; 567 online stories; 1,592 network television stories; 3,726 stories on cable news; and 1,123 stories from radio programs. To ensure that all relevant stories were identified and captured, PEJ researchers began by identifying all stories that were primarily about “presidential bids for 2008,” as labeled in the “big story” category. Big stories are particular events in the news that extend over a period of time and are featured in multiple news outlets during the time period under study. For the 4.5-month time period studied, this resulted in 7,592 stories.Then, to narrow that universe down to stories specifically addressing religion and the campaign, the study took an additional step. 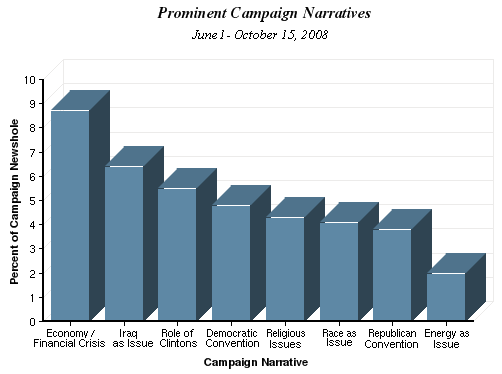 All campaign storylines – termed “sub-storylines” – which were focused on religious issues in the campaign (a total of 16 in all) were extracted for more in-depth analysis. This process resulted in a total of 283 stories: 23 newspaper stories; 26 online stories; 46 network television stories; 124 stories on cable news; and 64 stories from radio programs. A previous report, which analyzed religion coverage in the primaries by assessing how stories were framed using the “broad story topic” and “presidential campaign topic” variables, indicated that a focus on the political process made up 81% of coverage. The rest comprised myriad substantive issues, including religion, which made up only 2%. Although the current study uses a different variable as its chief measure, “sub-storyline,” the “broad story topic” and “presidential campaign topic” variables yield the following results: 67% of the coverage focused on the political process between June 1 and Oct. 15, including the horse race. Stories framed as religion received 2% of the coverage. Finally, in an effort to analyze the ways in which individual candidates received different religion coverage, the lead newsmaker variable was used. If 50% or more of a given story is about one person, that individual is credited as the lead newsmaker. The basic NCI codebook codes for topic at three different levels, and also includes data coded, Story ID number, story date, source, broadcast start time, broadcast story start timecode, headline, story word count, placement/prominence, story format, story describer, and broadcast story ending timecode, geographic focus and campaign mention. The complete methodology for the weekly NCI has further details on the coding system and inter-coder reliability (https://www.journalism.org/about_news_index/methodology). – ABC Radio headlines at 9 a.m. and 5 p.m.
– CBS Radio headlines at 9 a.m. and 5 p.m.